"Morning Joe" host Joe Scarborough slammed the "hacks" at "The Daily Show" on Wednesday for only making fun of Republicans and giving a free pass to Democrats. Discussing a July 15 New York Times piece that described how TV comics and talk show hosts are hesitant to make fun of Barack Obama, Scarborough mocked, "I never want to hear anybody from 'The Daily Show' or any of these other shows ever saying again, 'We speak truth to power.' 'Cause you know what they do? They speak truth to Republicans." After admitting that Republicans have made many mistakes over the last seven years, the MSNBC host continued to eviscerate the crew at the "The Daily Show" and others: " But, please, don't be subversive, because you're not. Because you're a hack. You're a hack for the Democratic Party and you only tell jokes about one side." New York Times journalist John Harwood, appearing on the program as a guest, attempted to stick up for the comics by justifying, "I don't think they are hacks for the Democratic Party. People write about what's funny to them. And the stuff that's funny to them is, is the stuff that comes out of what they see that they want to make fun of from Republicans." Mika Brzezinski, the resident liberal co-host on "Morning Joe," offered a not-so-vague warning to anyone who would dare crack jokes about Obama: "But my point is that there are layers of what's politically correct and layers of what potentially could incite the wrong things." She want on to boldly claim that it's simply very hard to make fun of the Democratic contender: "When have you a candidate who is black and who has a name people have made fun of and have bad information on the internet on, I think there are layers here that present really great challenges." JOHN HARWOOD (New York Times): It's hard to be provocative and funny about your own side. It's easier to do it about the other side. HARWOOD: Same with talk radio. Talk radio is sharper when a Democrat is in power than Republicans are in power. MIKA BRZEZINSKI: This is not about being in the tank. SCARBOROUGH: I just-- I never want to hear anybody from 'The Daily Show' or any of these other shows ever saying again, 'We speak truth to power.' 'Cause you know what they do? They speak truth to Republicans. Republicans are funny. They have been idiots and jackasses over the past seven years. But, please, don't be subversive, because you're not. Because you're a hack. You're a hack for the Democratic Party and you only tell jokes about one side. BRZEZINSKI: Joe-- No, this is not about being in the tank. HARWOOD: No. Well, but hold on a second. I don't think they are hacks for the Democratic Party. People write about what's funny to them. And the stuff that's funny to them is, is the stuff that comes out of what they see that they want to make fun of from Republicans. That's what-- It's in the same way that if you are a columnist or if you are a commentator, it's much easier to whack the other side than to be sharp about your own side. SCARBOROUGH: Oh, sure. I understand that. Which means, and we all know this is the case, that on the 'The Daily Show' and other shows like this, they only have people with one world view. HARWOOD: That's a fair point. SCARBOROUGH: Will you please go back and read the article before you say anything else about this? BRZEZINSKI: I will read the article. SCARBOROUGH: Because you have people admitting on these staffs that they don't want to make fun of somebody because they are supporting them. That's as clear as it gets. HARWOOD: No, no, no. They didn't say it's because they were supporting them. They were saying they weren't seeing the humor, weren't finding the humor. That's a different thing. It's not that they are trying to serve a political agenda, it's what is it that moves them? What is it that gets a joke out of them? SCARBOROUGH: Go over there some time. Go over there sometime. BRZEZINSKI: But I really think you are missing a bigger problem here or challenge, however you want to put it, for comedy writers or for satirists, I hope I'm using the right word there. But my point is that there are layers of what's politically correct and layers of what potentially could incite the wrong things. When have you a candidate who is black and who has a name people have made fun of and have bad information on the internet on, I think there are layers here that present really great challenges. SCARBOROUGH: You know what? Okay, Mika, just stop. Just please stop. BRZEZINSKI: No, it's not about being in the tank. It's about being responsible. HARWOOD: I don't agree with that. 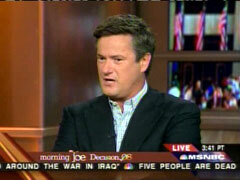 SCARBOROUGH: Oh, you don't-- You don't think they have made fun of Condi Rice? BRZEZINSKI: She's been made fun of, but not for being black or a Muslim. HARWOOD: Not that they've never made fun of Barack Obama ,either. I think there's a filter applied to them as well. I mean, you can't say there's no difference between the dominant group in society and the not dominant. HARWOOD: There are cartoons of Barack Obama, too. SCARBOROUGH: Oh really? With lips out to here? Exaggerated lips? SCARBOROUGH: Yeah, exactly. Ears are not seen, racists do not focus on ears when making fun of African-Americans. MIKA BRZEZINSKI: This is a point. SCARBOROUGH: -- of Condoleezza Rice. No, from mainstream people. Where nobody even brought it up. Nobody was even concerned. I'll guarantee you Condoleezza Rice noticed. HARWOOD: Show me that. I'll be surprised to see that.